UW, MU Ready to Prove Their Worth ~ The Bucky Channel - The World of Sports from Wisconsin's Perspective. Both state schools were entering conference play after faring well in the early part of their seasons. However, both schools also had some losses they wanted back, and both schools were ready to prove themselves in their conference opener. Marquette came into their New Year's Day showdown with Villanova ranked 25th in the nation. While for some teams it's just nice to be ranked, in the Big East a number 25 ranking means you're just in the middle of the pack. I don't think Marquette has what it takes to be the best team in the Big East, but they are certainly going to be competitive. If they play up to their potential, they could easily steal a game from either UConn or Pittsburgh and be a top three team in that conference. A 79-72 win over #13 Villanova showed the Golden Eagles are on the right track. 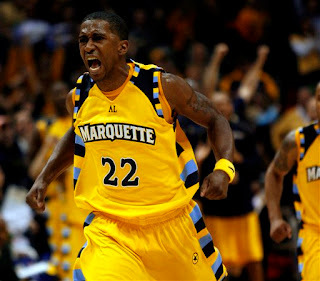 Jerel McNeal lead MU with 24 points in a game where Marquette really only used a seven man rotation. This is a team that had relied on it's depth in games earlier this season, but four starters saw 35+ minutes against Villanova. An impressive win, with even more impressive all-gold jerseys. One day prior, the Wisconsin Badgers also proved they were ready for conference action with a 73-61 win over #24 Michigan. A lot of people are saying this is one of Bo Ryan's weaker squads in the last handful of years, but I wouldn't count the Badgers out just yet. So far this season, the Badgers have been beating the bad teams, and losing to the ranked ones. Their win against Michigan was their first win against a ranked opponent all season, which leads to the question: Michigan was ranked? I guess I hadn't realized they were decent again. It doesn't matter who Bo Ryan has on his squads, his style of play is perfect for the guys he recruits. I still think a guy Marcus Landry or Trevon Hughes needs to step up and be the kind of player they had in Alando Tucker before the Badgers are a top Big Ten team, but they definitely won't be an easy opponent to face. Both Marquette and Wisconsin came into their conference schedules with something to prove, but one victory isn't going to be enough to quench their thirst. Both teams are sort of in the same position in their conference, both teams are being doubted and being compared to as shadows of the teams they used to be. Both teams have also become quite good as proving people wrong. Except them to do the same this year. Man the Big East looks STRONG this year! Eight teams from the conference are currently in the top 25. I watched Georgetown's upset of UConn on the road & I nearly peed my pants out of fear. I have a feeling they're going to eke one out at home vs. Pitt this Saturday. Marquette looked good vs. Nova & they should have a pretty darn good season. I could see Marquette entering the conference tourney around the middle of the polls & could go to the Sweet 16, possibly the Elite 8 in March. Bucky will be lucky to get out of the second round in March. I disagree with your comment saying that MU has relied on it's depth in earlier games this season. It's quite the opposite. There is such a lack of depth because of the injuries to Chris Otule and Joe Fulce (who never really will get adjusted to Big East play until next year) and the regression of talent in players like David Cubillan. It's been nice to see Jimmy Butler and Pat Hazel prove their worth, but you saw what happened against Tennessee when Jerel went out. This team can't operate without those four starters. The gold jerseys are impressive though. I know that their depth hurt the Badgers in that contest, but you're right about everything else. I guess I should have just clarified that MU has more depth than UW, in my opinion. You're right though, Marquette would suffer with injuries to any one of their top four, and it won't be pretty next year when these guys graduate.